This means that we are dealing with an entirely unknown SCEV value, and only represent it as its LLVM Value. This is the "bottom" value for the analysis. 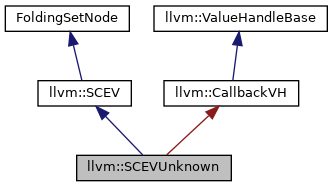 Definition at line 408 of file ScalarEvolutionExpressions.h. Definition at line 446 of file ScalarEvolutionExpressions.h. Definition at line 443 of file ScalarEvolutionExpressions.h. Definition at line 429 of file ScalarEvolutionExpressions.h. Referenced by CompareSCEVComplexity(), containsUndefs(), llvm::ScalarEvolution::createAddRecFromPHIWithCasts(), getCastsForInductionPHI(), llvm::ScalarEvolution::getCouldNotCompute(), llvm::getStrideFromPointer(), llvm::ScalarEvolution::getWrapPredicate(), isIntegerLoopHeaderPHI(), llvm::SCEV::print(), PushDefUseChildren(), llvm::SCEVExpander::setChainedPhi(), llvm::ScalarEvolution::verify(), and llvm::SCEVParameterRewriter::visitUnknown(). Definition at line 490 of file ScalarEvolution.cpp. Definition at line 515 of file ScalarEvolution.cpp. References llvm::Type::isArrayTy(), llvm::Type::isStructTy(), and llvm::SCEVCastExpr::Ty. Test whether this is a special constant representing a type size, alignment, or field offset in a target-independent manner, and hasn't happened to have been folded with other operations into something unrecognizable. This is mainly only useful for pretty-printing and other situations where it isn't absolutely required for these to succeed. Definition at line 473 of file ScalarEvolution.cpp. Definition at line 409 of file ScalarEvolutionExpressions.h.